Vitamin K is the name given to a group of related fat soluble chemical structures that are involved in Gla-Protein synthesis (these play a role in blood clotting) and bone metabolic pathways. Deficiency of this group of vitamins is a known osteoporosis risk factor; deficiency is also associated with arthrosclerosis and cancer. Vitamin K was initially identified as playing a role in blood coagulation and takes its name from the German word for this ‘Koagulation’. There are two major classes of the Vitamin: K1 (phylloquinone) and K2 (Menaquinones). The first group is found naturally in plants, whilst the latter form is largely produced by the bacteria Bacillus subtilis natto (commonly found in soil and in the gut of humans). There are two naturally found forms of Vitamin K.
In animals, it is the K2 form of the vitamin that is used to catalyze biological processes by enzymes. Vitamin K1–which plays a role in photosynthesis and is naturally present in large amounts in leafy vegetables–is easily converted into the required K2 vitamer in humans. In addition to the natural forms of the vitamin there are also three known synthetic vitamers: K3, K4, and K5; one of these K3 (menadione) is known to be toxic. There are three proteins that are dependent on vitamin K for correct function in the bones: these are the Gla-protein S (synthesized by the bone forming osteoblasts; MGP (Matrix Gla-protein) and Osteocalcin. It is therefore no surprise that vitamin K plays an active role in bone health and that a deficiency of it is associated with the bone thinning and lack of density that can lead to osteopenia and osteoporosis. It is known that vitamin D plays a major role in the regulation of the protein osteocalcin (synthesized by the osteoblasts). In addition to the presence of vitamin D, the osteocalcin is not able to bind minerals if its glutamic acid residues have not been first subjected to gamma-carboxylation by vitamin K. Although the exact function of osteocalcin, concerning bone health, are not completely understood, it is considered to play a role in the mineralization of bone tissue. The second vitamin K dependent protein, MGP is known to play a role in preventing the calcification of cartilage and soft tissues; it also plays a role in the development and facilitation of bone growth. Other than the fact that it is synthesized by osteoblasts, little is known of the role of Gla-protein S with regards to bone health. It has been observed that there is decreased bone density in children who are deficient in Gla-protein S.
Although the capacity by vitamin K alone is controversial, it has been reported that there is a correlation between low bone mineral density levels/bone fracture incidence, and low levels of circulating vitamin K. It has been also been that there reported that there is an increased risk of hip fractures in women who have an intake of less than 109 µg of the vitamin per day. The main reason for this increased fracture risk is thought to be a result of osteocalcin being under carboxylated. Treatment of postmenopausal women with 45 mg per day of the vitamin K2 form MK-4 has been reported to have decreased the risk of new fractures by a third; and an increases in lumber bone mineral density observed. Epidemiological studies have suggested that in 72,000 women (nurses monitored over a ten-year period) there was a strong correlation between vitamin K intake and hip fractures risk–with a 30% reduction in risk in the highest 25% consumption group in comparison with the lowest 20% group. Furthermore, in a seven year study involving 800 elderly people it was found that the highest quartile–whom consumed around 250 µg of vitamin K per day–had a 65% lower chance of having an hip fracture than those in the lowest quartile–around 50 µg of daily vitamin K intake. In addition to the natural role that the vitamin plays in bone mineralization, it is reported that when the vitamin K2 form MK-4 is given in combination with the bisphosphonate Risedronate, that there is an increase in femur strength in mice in comparison to controls. Further to this, 45 mg of vitamin K2 MK-4 given in combination with the bisphosphonate alendronate (Fosamax) has been reported to reduce the amount of under carboxylated osteocalcin and increase the bone mineral density in the neck of the femur in comparison to treatment by alendronate alone. As vitamin K is found in many different foods it is rare for deficiency of it to occur in adults. Further to this the vitamin is naturally conserved by the vitamin K cycle, and is readily produced by bacteria present in the human gut. There is a risk of vitamin K deficiency in people taking anticoagulant medications; who have liver damage; and in infants that are breast fed. The Linus Pauling institute currently recommends that people over the age of 65 and at increased risk from bone fractures should take vitamin K in the form of multivitamin supplements and eat at least a cup of leafy vegetables (240ml, weight varies) every day. This is in line with the report that a daily dose of 250 µg of vitamin K was demonstrated to lower the risk of hip fracture by as much as 65% in the Framingham Heart Study. The Vitamin K recommended daily adequate intake table below is based upon information available from the the Food and Nutrition Board. As mentioned above Vitamin K1 is found abundantly in plants. It is located in chloroplasts and involved in the electron transport system associated with photosynthesis. It is therefore no surprise to learn that leafy vegetables such as Kale, Brussels sprouts and spinach are an abundant source of this vitamin. Additionally, K1 is also found in many vegetable oils such as soybean, cottonseed, rapeseed, and olive; of these, only olive oil is recommended due to hydrogenation of the others. Kale is a fantastic source of vitamin K. The K1 form is easily converted into the biologically active K2 form by bacteria in the gut. 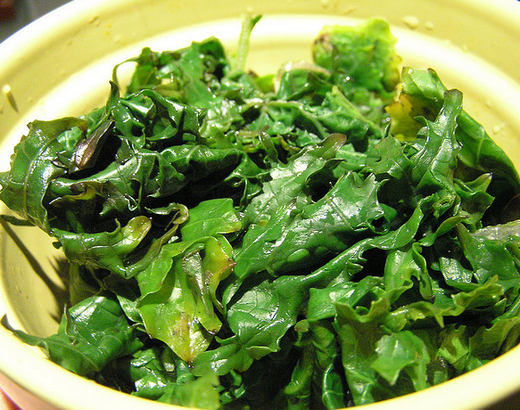 A 100g serving of cooked Kale supplies over 800 mcg of valuable vitamin K. Kale photograph by Laurel Fan/CC. In fact over 90% of Vitamin K in the western diet is consumed in the K1 form. The major natural form of K2 consumed (largely by Japanese people, but not a significant part of the western diet) comes from fermented soybeans (Natto). In western diets the naturally consumed K2 vitamer is mainly produced by lactic and propionic acid bacteria; these are used in cheese production. A smaller amount of K2 also comes from egg, eels and organ meat products. The following vitamin K rich foods list is based on information from the USDA. Due to the natural abundance of vitamin K there is usually little need for it to be taken as a supplement for most people; the K1 form is often included in many multivitamin supplements, and does not require a prescription. It is noteworthy that in Japan the K2 form MK-4 is used in the treatment of osteoporosis at a dosage rate of 45 mg per day. Its recommendation for use as a treatment for osteoporosis is currently under consideration in many western countries. The cheaper K2 form MK-7 is not usually recommended as much of the population is not able to process it effectively due to genetic reasons; this can lead to a buildup of this isoprenoid form in the body that may lead to side effects. It is also noteworthy that most of the available vitamin K2 supplements on the market come in 100 µg (mcg) or less doses and are therefore at nowhere near the levels shown to be effective by research. It is often the case that manufacturers sell their products in a 45 mcg size; this is because many people will associate the 45 with the amount used to treat osteoporosis in Japan; In reality these products are being sold at strengths that are 1000× less than used in the studies. Although natural K1 and K2 vitamers are not known to be toxic, even at high doses. The synthetic K3 form is known to interfere with the antioxidant glutathione in the body; this can lead to the side effect of damage to the cell membranes; injection of synthetic vitamin K has been associated with jaundice, liver toxicity, and hemolytic anemia. The function of vitamin K is also known to be antagonized by very high dosages of Vitamin A and E, and by anticoagulatory medications; the former has an effect upon the absorption of vitamin K, whilst 1000 IU of vitamin E can inhibit carboxylase enzymes. Vitamin K is found naturally in two main forms: k1 in plants, and K2 (produced by bacteria). The body is readily able to convert K1 into the active K2 form. As vitamin K is available in a large range of plants supplementation is not usually required by the general population until they reach the age of 65. People over the age of 65, or in at risk from osteoporosis should consider taken a multi-vitamin supplement and consume one cup (100 to 150 g) of leafy vegetables such as Kale, spinach and broccoli daily. Use of vitamin K2 form MK-4 is used for osteoporosis treatment in Japan, where it has been linked with a decrease in the incidence of fractures by as much as 81% (nonvertebral) and an increase in bone mineral density. As the amounts of vitamin K used in the Japanese studies are 500 times the RDA, and based on cohort studies, the recommendation for use of high dose vitamin K supplements in the treatment of osteoporosis in western countries is still under consideration;it should be noted however that the IOM currently says that at the present time no adverse effects have been associated with natural consumption of vitamin K in humans.